Every year, June 5 is observed as World Environment Day to raise awareness and increase government action on the pressing issue. This year, the theme is ‘Beat Plastic Pollution’ with focus on single-use or disposable plastic. India is the host to this year’s World Environment Day. Minister of Railways Piyush Goyal on Tuesday announced on twitter that as part of the World Environment Day and contributing towards a greener planet, the Indian Railways has started using fully-biodegradable packages in four Shatabdi and four Rajdhani train from Delhi. Nagaland joined the rest of the country in observing World Environment Day with Chief Minister Neiphiu Rio setting December deadline to “free the state of plastic waste”. At a programme at NBCC Convention Hall in Kohima, Mr. Rio called upon the people to reaffirm their commitment to create a “plastic-free state” in the next six months. The CM listed the harmful effects of polythene bags on the environment. “Plastic bags choke drains and gutters, causing them to overflow. Burning plastic also results in release of toxic gases,” he said, adding that people need to take measures to end the menace. Urging people to replace plastic bags and cutleries with eco-friendly products, the CM stressed the importance of planting trees to curb pollution. He asked Chief Secretary Temjen Toy to set up a task force to achieve the goal of creating a ‘plastic-free Nagaland’ by December. “As promised in the election manifesto, the People’s Democratic Alliance government would be launching ‘Clean and Green Nagaland’ campaign soon. The government has also resolved to plant at least 48,000 saplings in the next one week,” Rio said. On World Environment Day, Tamil Nadu has decided to ban single use plastics such as polythene bags and bottles. The decision was announced by Chief Minister Edappadi K. Palaniswami in the Assembly. The ban will come to effect from next year and essential goods such as milk, oil and medicines have been exempted from the ban. The State has already banned manufacture and use of plastic bags below 51 microns. Himachal Pradesh Chief Minister Jai Ram Thakur on Tuesday announced a ban on use of thermocol plates in the state as they are major cause of pollution, as well plastic water bottles less than one litre capacity at official functions. Making the announcement at the state-level function to mark the World Environment Day at Sundernagar town in Mandi district, he said a steel bottle would be provided to each student in all government schools in the state to discourage the use of plastic bottles. Mr. Thakur also announced that 10 solid waste management plants would be established across the state for scientific management of waste. “Greetings on #WorldEnvironmentDay. Together, let us ensure that our future generations live in a clean and green planet, in harmony with nature,” tweeted Prime Minister Narendra Modi. Vice President M. Venkaiah Naidu urged citizens to get back to the roots and preserve the nature. “From times immemorial Indians believed in living with nature as encapsulated in ‘Vruksho Rakshathi Rakshithaha’. Let us get back to our roots and preserve our culture and nature. All of us have a responsibility to handover a greener and cleaner planet for our future generations. Take our short quiz to let us know how you deal with plastic pollution on World Environment Day. According to the United Nations, the last decade has seen more plastic production than the whole of last century. And, according to a Central Pollution Control Board (2015-16) report, the estimated plastic waste generation per annum in our country is 15,89,418 tonnes. About 50% of plastics used are single-use products like straws; and about 500 million straws are used daily in the U.S. alone. For India, World Environment Day 2018 is not a “symbolic” celebration but a mission, Union Environment Minister Harsh Vardhan said at an event. The Minister invited people to take care of their Green Social Responsibility and urged them to take up Green Good Deeds in everyday life. He said 700 Green Good Deeds were available and people required to take small positive actions without any extra efforts that could help conserve the environment. Addressing the gathering, Erik Solheim, Executive Director, U.N. Environment said plastic was a huge environmental and health issue. He mentioned individual efforts in tackling plastic pollution and taking specific measures to deal with single use plastic. Union Environment Secretary C.K. Mishra said great ideas had come up during this event and there was need to package all these ideas in a nice way. He also briefly highlighted that the Paris Agreement (PA) and Sustainable Development Goals (SDGs) are the two important agreements that have been adopted in the year 2015. Greenpeace has urged Fast Moving Consumer Goods (FMCG) companies to take a “hard look” at their production of plastics and commit to “100 per cent recycling” of their waste. 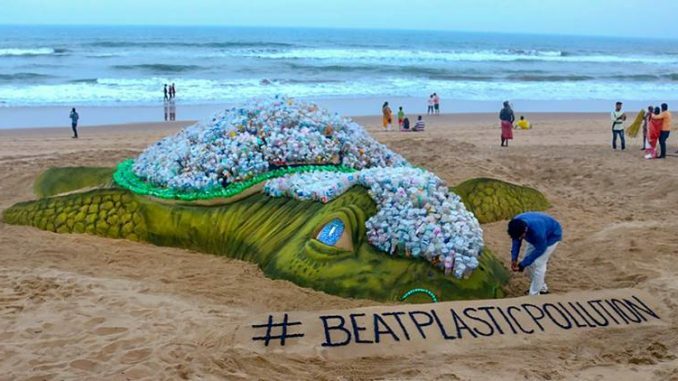 Greenpeace India, in a statement, sent a strong message to the retailers and FMCG manufacturers, and urged them to “take responsibility for the trash they produce“. “Greenpeace is calling on companies and manufacturers to take a hard look at their production of plastics and commit to 100 percent recycling of their waste,” it said.